Being at the heart of the community and a significant local employer Ailsa is conscious of its position and its responsibility to give something back. Since 2004 we have been raising funds for charity which have to date totalled in excess of £140,000.00. Those funds have been distributed to, Macmillan Cancer Support, St Andrews Hospice, Breast Cancer Care, Yorkhill Hospital and other smaller local charities. 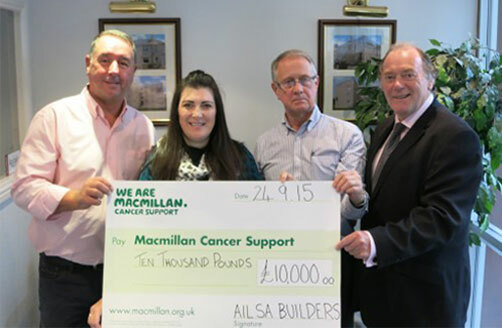 We were delighted this year to be able to donate £10,000.00 to both St Andrews Hospice and Macmillan Cancer Support. Most of the funds donated are raised at our annual charity dinner held in May each year and loyally and generously supported by our suppliers and associated companies.